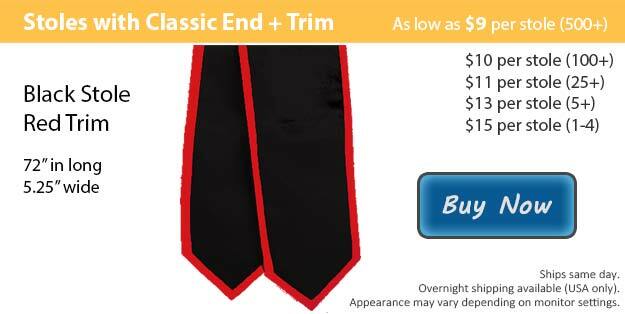 A black graduation stole with red trim is a terrific way to represent yourself at your graduation this year. The brilliant red glistens against the black stole for a sensational outcome.After years of hard work, graduation is finally coming up quick. Here at Honors Graduation we can help you to put your graduation wardrobe together with ease. We know the amount of effort it takes to successfully complete your schooling and make it to graduation. That is why we strive to help graduating students look phenomenal on their big day. As your family and friends come together from all around to help you celebrate, you will want to look absolutely perfect and we have everything to help you do it! It is typically a requirement for graduating students to wear a graduation cap and gown at the time of their ceremony and normally they are encouraged to accent their outfit in some way. We provide bundle deals including the basic necessities all the way to customized items in order to help you achieve the exact look you are going for. In addition to helping your group or club stand out, our custom stoles make for a great keepsake to hang in your home or office and always be reminded of your success. We use embroidery to customize your stole allowing you to choose the thread color as well as the image and/or wording to make it something you will cherish forever. We have a large selection of colors to choose from allowing you to create the perfect graduation stole to complete your outfit. There are two types of finishes for the graduation stoles, the angled cut and the classic cut. Each stole option can be purchased with or without trim in case you want a single colored stole.